BRAND NEW 2 (50mm APPROX) LIFT KIT TO SUIT YOUR. 2012-ON ISUZU D-MAX TFS85 / V-CROSS 4WD MODELS. EXCLUDES PRE-2012 MODELS WITH TORSION BAR FRONT. PLEASE STATE THE ACCESSORIES / EXTRA WEIGHT YOU MAY HAVE ON THE FRONT OF YOUR RANGER AT THE CHECKOUT. (IE STEEL BULLBAR, WINCH, BRUSH BARS, DUAL BATTERIES). WHY ARE OUR KITS SO CHEAP? SO YOU STILL GET AN AMAZING QUALITY PRODUCT FOR A FRACTION OF THE PRICE! PRE-ASSEMBLED STRUTS ALLOW FOR QUICK AND EASY INSTALLATION SAVING YOU TIME, THE REAR SHACKLES ALLOW YOU TO EASILY LIFT THE REAR WITHOUT HAVING TO REMOVE AND MAN HANDLE THOSE HEAVY LEAF SPRINGS! AI FRONT 41 mm BORE FOAM CELL FRONT STRUTS. FRONT COIL SPRINGS TO SUIT. FRONT STRUT TOPS + ASSEMBLY. AI REAR 41mm BORE SHOCK FOAM CELL ABSORBERS. AI REAR EXTENDED SHACKLES (anti inversion). FRONT SPRINGS TO MADE TO SUIT YOUR ACCESSORIES. THESE SPRINGS WILL RAISE THE CAR APPROX 2 INCHES FROM FACTORY STANDARD RIDE HEIGHT IN THE FRONT & 2 INCHES IN THE REAR. ALLOW YOU TO INCREASE YOUR TYRE SIZE ALLOWING MORE GROUND CLEARANCE! GREAT FOR COSMETIC ENHANCEMENT FOR YOUR CAR AND. TWIN TUBE DESIGN FOAM CELL SHOCKS. HIGHEST QUALITY AVAILABLE X5K SPRING STEEL BY COIL SPRINGS. 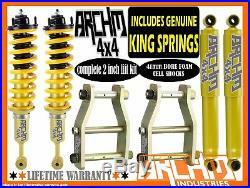 ARCHM INDUSTRIES CAN SOURCE ALL YOUR SUSPENSION NEEDS FOR MOST MAKES AND MODELS. Product names, logos, and brand trademarks are property of their respective owner. All company, product and service names used in this website are for identification purposes only. Use of these names, logos, and brands does not imply co-operation, endorsement or affiliation with ARCHM Industries. The item "ISUZU DMAX MODELS 2012-ON ARCHM4X4 / COIL SPRING 2INCH 50mm SUSPENSION LIFT KIT" is in sale since Saturday, December 13, 2014. This item is in the category "Vehicle Parts & Accessories\Car, Truck Parts\Suspension, Steering\Lift Kits". The seller is "archm-suspension" and is located in Bayswater, Victoria. This item can be shipped worldwide.